The Ganesh utsav is always celebrated with enthusiasm and energy. But the day after the visarjan the beach tells a different story. The debris littered all around causes immense water pollution, generates unwanted waste that deteriorates the aesthetic view. 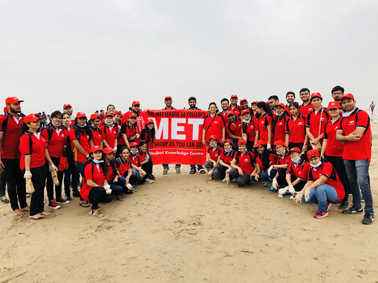 The MET Institute of Management (MMS) students, like every year, came together for helping with the clean-up at Juhu Beach on 24th September, 2018 at 6:00 am ready with their masks and gloves. 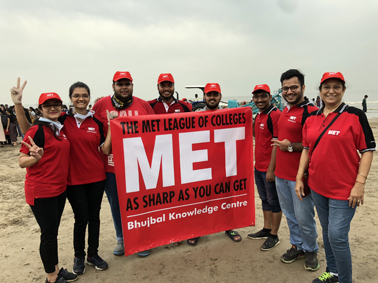 The coordination and the team spirit in carrying and collecting the waste showed the true work of the METizens and everyone gave their best to the task. The severe consequences on the environment were unveiled and students have become even more aware and responsible for eco-cause.